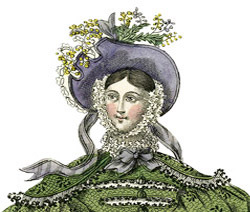 Hats and bonnets of the Romantic Era were magnificent creations overflowing with ruffles and frills, exotic plumes, vivid flowers, and yards of colorful ribbons. 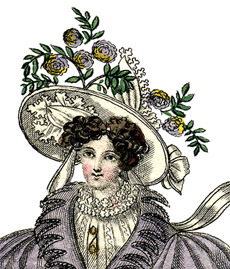 Elaborate hair styles were topped by these wide-brimmed creations or the face was framed by the frills of a white ruffled cap. Bonnet trimmings were removed and replaced with ease to create a fresh look for each new dress. This striking wide-brimmed bonnet (c.1828-32) is made with a wire form covered with silk and lined in linen. 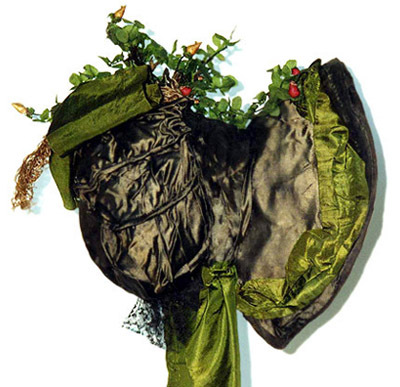 Four-inch-wide green silk ribbon borders the brim, decorates the crown and fashions long ties on each side. A black netting ruffle forms a skirt at the back neck. 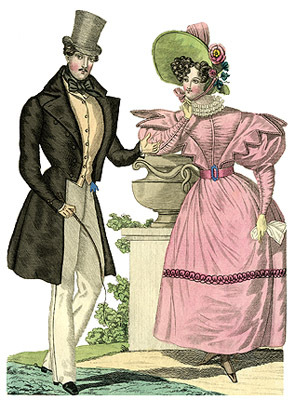 Extraordinary attention was lavished in the garnishing of the bonnet to reflect the opulence of Romantic Era fashions. 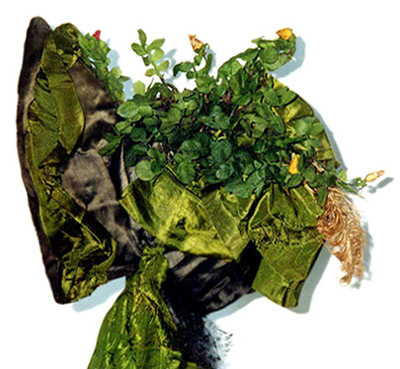 The bonnet trimmings create a miniature flower garden with green fabric foliage, yellow waxed flower buds, and round red berries. Added to this – a brown ostrich feather.